SONOSIM SUMMARY: While CT and MRI are commonly used to evaluate the laryngeal tract, this study utilizes US to characterize images of laryngeal tract physiological motion and to track symmetry during neck abduction and adduction. 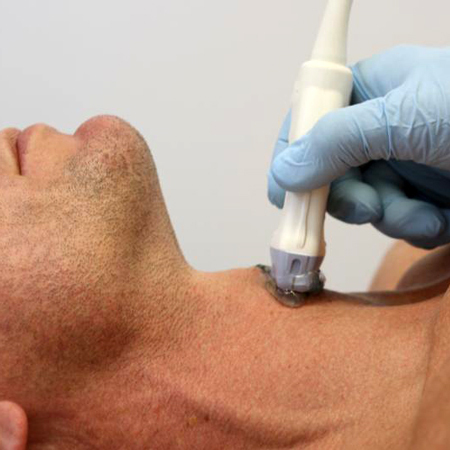 Observations using ultrasound were used for evaluating the true vocal fold motion. Characterizations were then made based by selecting three clearly defined landmarks created by the anterior insertion landmark and the left and right arytenoid cartilage. Proper orientation and image selection of these landmarks allowed for accurate determination of mobility, which are helpful for the diagnosis of recurrent nerve paralysis. Further research is needed for characterization of the pathology diagnosis for laryngeal anatomy and arytenoid movement. Bergeret‐Cassagne H, Lazard D, Lefort M, et al. Sonographic dynamic description of the laryngeal tract: definition of quantitative measures to characterize vocal fold motion and estimation of their normal values. J Ultrasound Med. 2017 May;36(5):1037-1044.